The Coinage Act grants the Secretary of the Treasury rather broad coin seigniorage authority. Geithner could sidestep the debt ceiling this afternoon by ordering the West Point Mint to coin a 1 oz. $ 1 trillion coin. 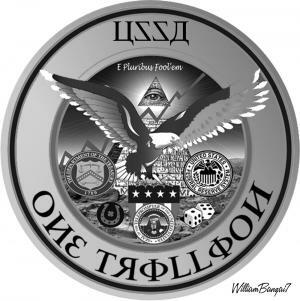 Tsy can then present the jumbo coins at the NY Fed to buy back $1 trillion in Fed-held debt (the Fed has to accept it, a creditor can’t refuse legal tender paid in to settle a debt). It has now gone so far that Rep. Greg Walden, R-Ore., announced today that he plans to introduce a bill that would make it illegal to mint high-value platinum coins as a means to paying down government debt. Some people are in denial about the need to reduce spending and balance the budget. This scheme to mint trillion dollar platinum coins is absurd and dangerous, and would be laughable if the proponents weren't so serious about it as a solution. I'm introducing a bill to stop it in its tracks," he said in a statement. "My bill will take the coin scheme off the table by disallowing the Treasury to mint platinum coins as a way to pay down the debt.